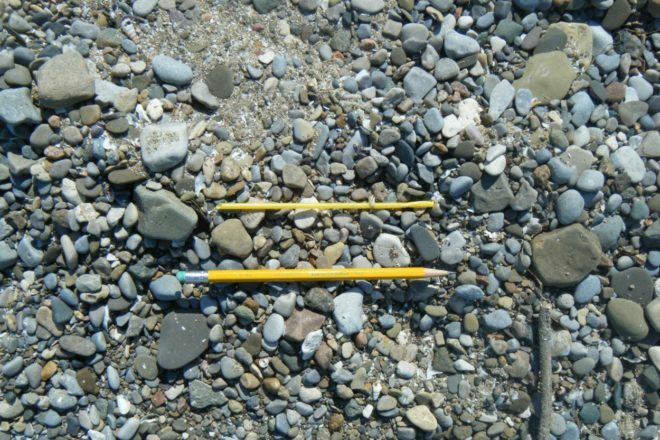 A plastic juice straw found on the shore of one of the Great Lakes. The pencil was staged for scale. Photo by NOAA. “That’s the last straw!” was a phrase my mother frequently uttered in exasperation. It was often coupled with, or closely followed by, “Go to your room.” Like most children, I took things literally. For years I was confused about why the fact that our household was running out of straws often resulted in my being sequestered for an hour or so. It was years later – sometime in grade school – that I learned about idioms and came to understand that my mother was invoking a version of an old proverb: It is the last straw that breaks the camel’s back. Or, said in less colorful language, it’s the small repetitive actions that can produce large, dramatic and oft times unbearable results. Fast forward half a century or thereabouts, and the seemingly minor, routine habits we’ve all indulged in have come home to roost – in our oceans, in our landfills, in our climate. One of the worst offenders on all three fronts is that seemingly harmless utensil, the plastic straw. All plastics contribute to global warming because they are produced with petroleum. Drilling oil and manufacturing plastics causes substantial amounts of methane and carbon dioxide to be leaked into our atmosphere, trapping heat. Single-use plastics, like straws, are the worst. Worldwide, this familiar, oil-based little polluter is the sixth most common type of litter and among the top 10 marine debris items. Americans alone throw away 500 million of them a day! The estimated time for a straw to breakdown when landfilled is 500 years, and putting them in your recycling bin can cost your community recycler lots of money over time to remove them. When confronted with the reality of climate change, people always ask: What can I do? Not using plastic straws is an easy way we can all take action. The key is strength in numbers. We can each help by simply not using plastic straws whenever possible. And we can work to get our communities and Wisconsin to join states like California and Washington, cities like Austin and Brownsville, Texas and Portland, Maine, and countries like Rwanda, to enact plastic bag bans or impose costs for using them, with plastic straws as the next target. Given the clear detrimental impact of plastic straws on our climate, oceans and landfills, it should be no surprise that there is already a targeted movement to reduce their use. Instead, the surprise is how rapidly this campaign has gathered a lot of momentum here and across Europe. Why? Perhaps because the plastic straw, with its easy and omnipresent familiarity in everyday life, is a perfect example of the price we are paying for countless casual, minor, thoughtless actions. Another contributing factor to success is that we have alternatives – accessible, environmentally friendly, cost-effective solutions – paper straws, pasta straws, even reusable straws, or just not using a straw. A number of restaurants, including some in Door County, are taking important steps today to address this issue responsibly, like not including a straw with a beverage unless requested and using paper straws. Thank them. And if your favorite restaurants are not yet on board, talk to them. Not offering plastic straws automatically will save money and demonstrate environmental responsibility. So the new symbolism of “the last straw” may be a much more hopeful one than that of our beleaguered camel. It may, at long last, come to signify that small, repetitive changes will, over time, lead to massive, meaningful transformation. The last straw can help break the back of the climate change camel. And with a little luck, it may get us all thinking about tackling the use of other harmful single-use plastics like water bottles, plastic grocery bags, toiletry bottles and coffee cups and lids. What’s the last straw for you? Using much less plastic in your life takes attention and commitment, but it’s not that hard. Lots of people starting small can make a huge difference! Judy Drew is the former Assistant Director of The Ridges Sanctuary in Baileys Harbor. She currently serves on the Climate Change Coalition’s Steering Committee and chairs its fundraising committee.